There are some female characters in G.I. Joe: Retaliation. 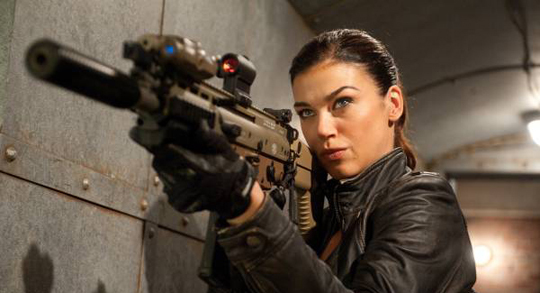 The more narratively significant of the pair, as played by Friday Night Lights‘s Adrianne Palicki, is a military operative by the name of Lady Jaye. Now, give that a moment to sink in. The sole female character with any real bearing on the story of G.I. Joe: Retaliation, has the word ‘lady’ as a part of her military handle. I repeat: it’s not just a sexist nickname her colleagues have given her — it’s actually on her official U. S. Military database file. As if to make amends for the supremely patronising moniker (which, to be fair, was carried over from an action figure that dates back to 1985) the film grants Lady Jaye a lengthy second-act monologue scene in which she lambasts the systemic misogyny of military life, and the constant prejudice she faces as a female member of the G.I. Joe unit. She goes on to describe the day that her cruel, conservative father explained that he would never serve alongside a female soldier, because ‘he couldn’t put his life in the hands of a woman’. The outrage she felt as a young, independent woman was such that she enlisted in the army the very next day. At this juncture I should probably mention that the scene in question is shot from the perspective of one of Lady Jaye’s male comrades, as he covertly watches her getting changed in the reflection of a TV screen. When she finishes her tale of patriarchal injustice, he turns to face her solemnly, and tells her that she looks nice.